We’re rather excited about our forthcoming “versus” hoedown with fellow Bristol-based disco-centric party-starters People Like Us at The Looking Glass this Friday (16th August). So excited, in fact, that Sell By Dave has laid down a spontaneous “warm-up mix”. 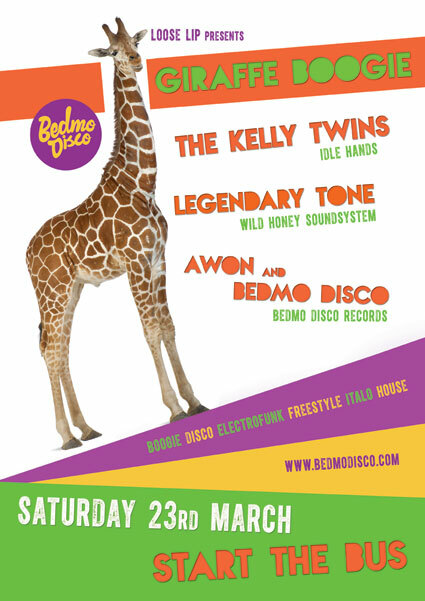 Ahead of the next instalment of GIRAFFE BOOGIE at Start The Bus on Saturday, we’ve got a bit of a treat for you – a classic old skool electro/boogie/space-funk mix up from headliners THE KELLY TWINS. The mix was recorded way back in 2008 for the sadly departed BYTE blog and party, where Sean and Dan were briefly residents. It caused a bit of a stir at the time, though it’s long been unavailable/lost thanks to the MP3 download link seemingly vanishing from the Internet. It’s such a good mix that we thought it deserving of a five-year anniversary re-post. At this point we should thank fellow Bristol DJ and longtime Kellys/Bedmo Disco friend Andy Clarkson (aka Andy Payback Hifi), who still had a rare CD copy and converted it to MP3 for us. These days, Sean and Dan are widely considered (and rightly, we think) to be rising stars, not just in Bristol but beyond. 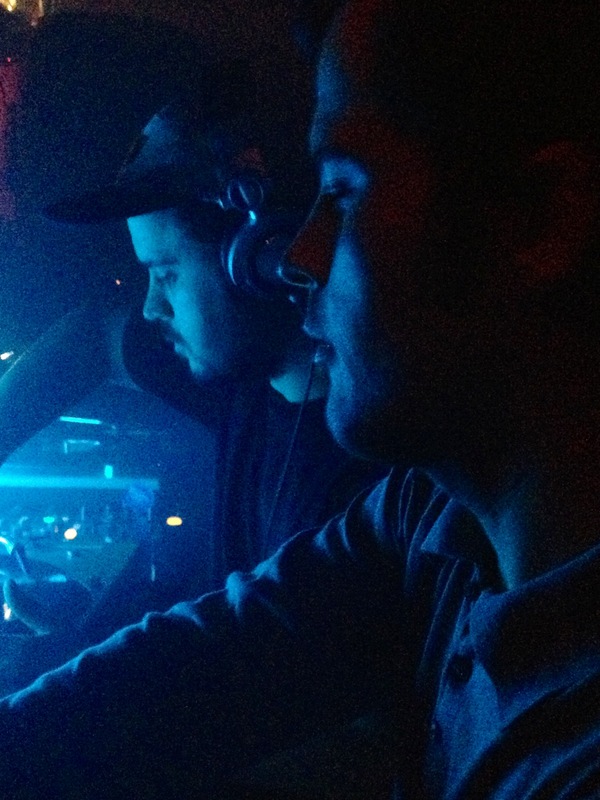 In our opinion they’re probably the most versatile and consistent DJs in Bristol. While their mixing is technically brilliant, what’s more impressive is their ability to take sets in many different directions and take the crowd with them. Put them in almost any situation – warm-up, peaktime, late, big club, small club, boozer, radio show – and they’ll get it right. They’re slowly moving into production, too, and recently dropped a collaboration with fellow Bristol DJ/producer Kowton for Red Bull’s Soft Rockets project. We first met them sometime around 2005/2006 (we think), in which days they were taking their first steps as student DJs in Bristol. They weren’t new to the DJing game, though – back in their native Plymouth, they first started DJing when they were 14, and by 16 were playing all over the city. They were quickly installed as residents at Sell By Dave’s best before: night. They then launched their own party, UFO (which Sell By was also a resident at), and since have held residencies at all sorts of regular parties, including Crazylegs and So Bones. They’re currently the in-house party-starters for our old pal Chris Farrell (another best before: resident back in the day) at his growing Idle Hands empire. We should also point out that they’re rightly the most in-demand DJs in Bristol. So, back to Galactic Jams. It was recorded at a time when they were indulging their electro/P-funk side and is a near flawless live mix-up of classic electro, electrofunk, P-funk and boogie jams. It’s this side of things they’ll be mining for their set at Giraffe Boogie (though we also hope that they drop in some freestyle, Italo, disco and house, since mixing it up is their forte). If you’ve not heard the mix before, you’re in for a treat. If you have, it’s worth giving it another listen – it really is a beauty! As for the party, scroll down below the tracklist for poster/details. New Year, new music. Over the festive period we’ve been busy bunnies, putting together a brand new mix and uploading a fresh new track from Awon. Both are below. Both are downloadable. We hope you enjoy both. The mix is a long promised mix-up by Bedmo Disco (Five-Stylez and Sell By Dave) for Paraplan Radio in St Petersburg, Russia. Those guys have been very supportive of us and the label over the years, so it’s nice to finally give them a mix (it was promised for about eight months… ooops). 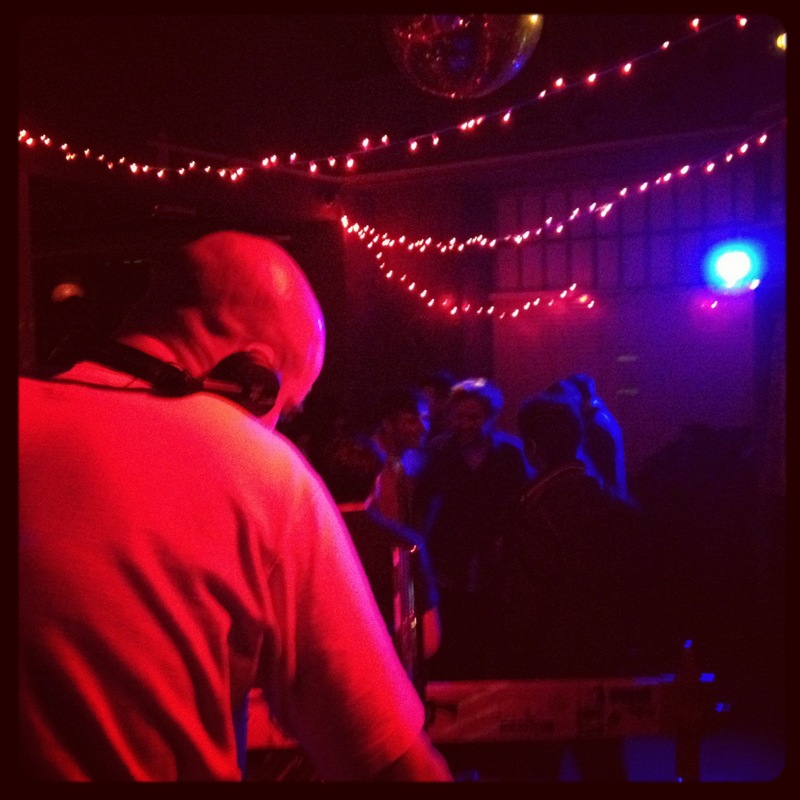 The mix dashes between original boogie, disco and re-edits. It’s a typical funtime selection. If you’ve got the January blues, give it a whirl! The other freebie is a brand new slo-mo jam from our man AWON. It’s called “White Hot Love” and it’s been getting some love on Soundcloud. Check it out below. ‘Tis the season for giving, so we’ve decided to award all those who follow us on Soundcloud with a brand new, previously unreleased cut from Awon. It’s called “White Hot Love” and it’s a delicious disco-funk slow jam – a 103 BPM MDMA chugger, if you will. Very loosely based on a forgotten soul fave from a disco/boogie singer, it’s a massive bundle of seductive charm. In other news, Bedmo Disco Radio returns today (Monday December 10) on http://www.passionradiobristol.co.uk, starting at 5pm GMT. Tune in and tweet us your shout outs/requests/what you’re doing/where you are etc via Twitter on @bedmodisco, or by text on 07794 655 178. Sell By Dave will be in the chair, dropping a good mix of warming tunes and talking rubbish on the mic. With a bit of luck, one of the other crew members might join him. 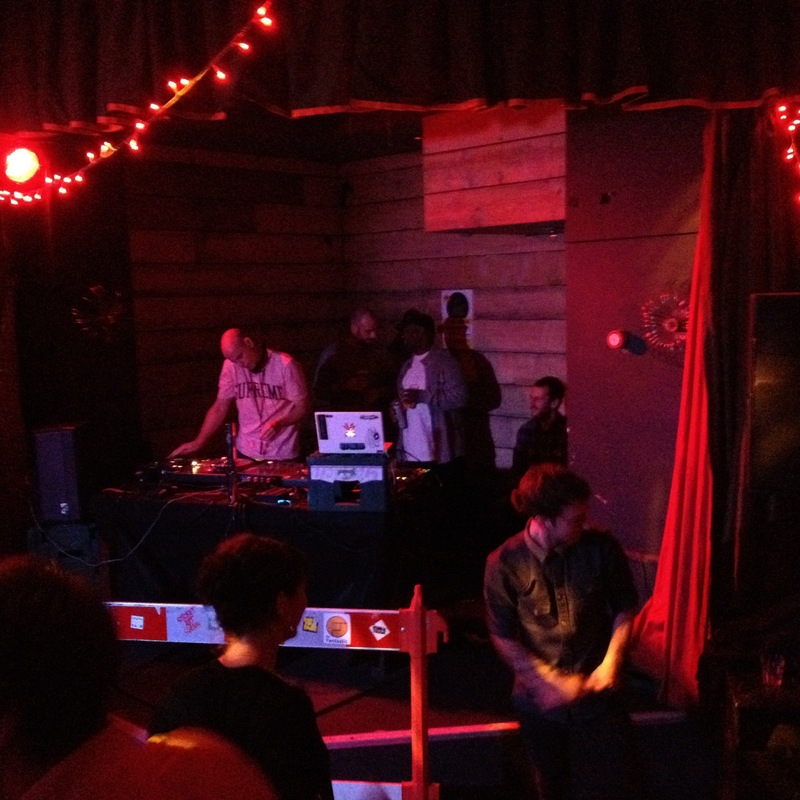 Finally, thanks to all those who headed down to our Christmas party at Big Chill Bristol on Saturday. It was, as usual, an excellent party – great atmosphere, great response, and huge numbers of people in dodgy Christmas jumpers. Good work crew! 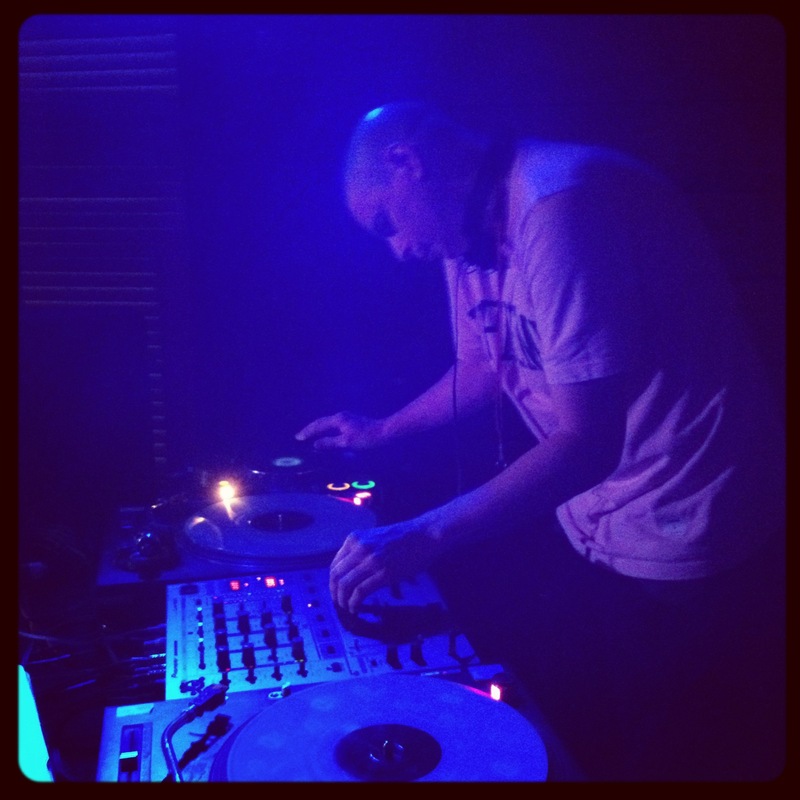 We’ve got a rather special treat for the latest edition in our BedmoCast mix series – it’s only a live recording of CHRIS DUCKENFIELD’s set at Saturday night’s GIRAFFE BOOGIE party at Start The Bus! Chris very kindly let us record his set, so we could capture some of the fun, excitement and downright debauchery of the party. We’ve been banging on about what a great DJ Chris is, especially when joining the dots between disco, boogie, house, funk and soul, and we reckon this recording captures that perfectly. Every time we listen, it brings back some hazy memories of the party and the characters that made it so special. Given that most of us were quite drunk, that’s no mean feat. It’s not quite his whole set – sadly, for various reasons we only captured 1 hour 45 minutes of the two hours plus he played for – but it’s almost a complete record of a memorable set. You can listen and download on the Soundcloud player below. While we remember, many thanks to all those who made it down and danced hard. Special shout outs to Deli G – local Bristol legend – who came and hung out with us and Chris, and of course Chris himself. As ever, he was a perfect gent and well and truly got the party started. Sell By Dave is still recovering from the shame of clearing the dancefloor (with a stone cold electrofunk classic, no less) before Chris came on. Ooops. There’s more pics of Chris in action from the night below. In honour of both our recent “B Funk” EP and the imminent party at Start The Bus of the same name, we’ve teamed up with the good people at House of Disco – one of the finest disco/house/deep house imprint’s currently operating, we reckon – to give away a previously unreleased Awon and Bedmo Disco track called “Take A Bow”. Said track was produced by Awon. It was re-edited by Bedmo Disco, then re-produced (after the original files got lost) by Awon. We’ve been playing it on and off in our sets for about six months and it always goes down well. You can download it via the House of Disco Update newsletter webpage. This Sunday sees the first ever Love Saves The Day festival in Castle Park, Bristol, and it looks like it could be a cracker. All the tickets have sold out, the line-up is a who’s who of party-minded DJ/live talent, and the weather looks promising. With everyone off work waving flags and cheering on the Queen’s Diamond Jubilee (or at least off work), it could be an absolute cracker. 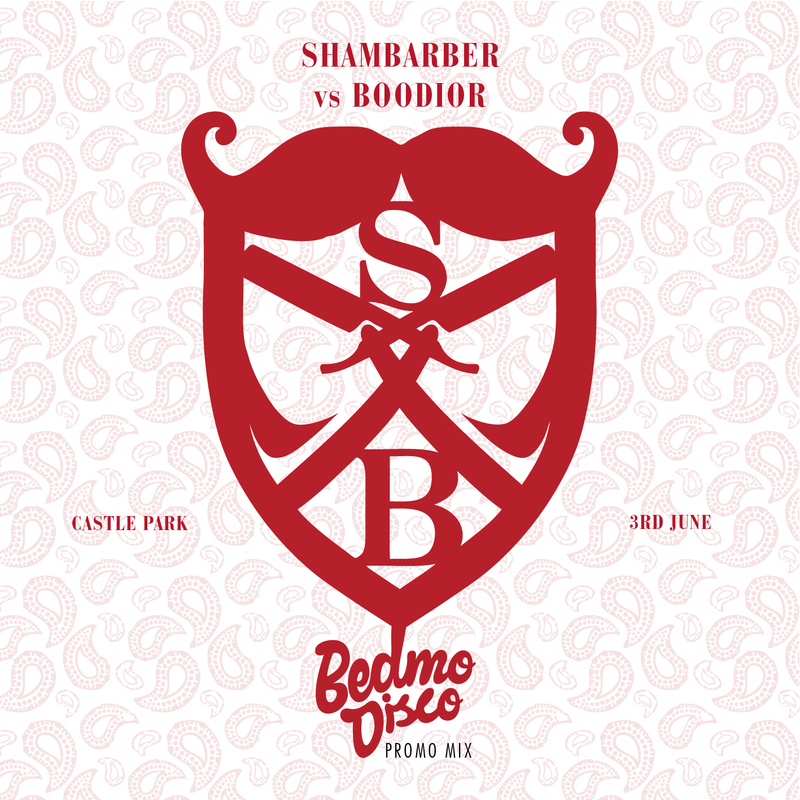 Bedmo Disco will be making an appearance, alongside DJ/production partner Awon, in the bar/dressing up/madhouse that is the Shambarver v Boodior bar. We’re rather excited about the chance to spin some quality disco, electrofunk, boogie, house and the like for these guys – they’re renowned party-starters and regularly host bars and tents at festivals – so we decided to do a warm-up mix to get everyone in the mood. It’s mixed by Sell By Dave and features a funtime mix of disco, boogie and electrofunk old and new, including house-tinted reworks, unreleased re-edits, party classics and unreleased label stuff. Hopefully you’ll all enjoy it. If you’re heading to Love Saves The Day, check us out – we’re playing from 2.30-4.30pm, right after Behling & Simpson’s special disco set. Whoop! 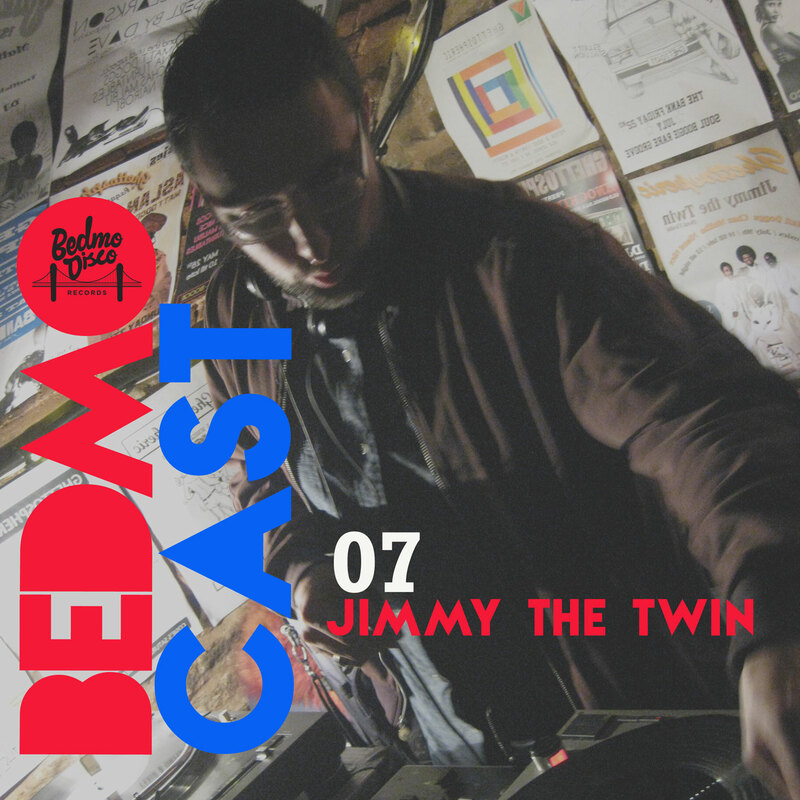 To celebrate the forthcoming release of Jimmy The Twin’s debut solo 12″ on Bedmo Disco Records, we’ve got the man himself to mix the latest installment of our ongoing BedmoCast series. Predictably, it’s a bit of a doozy. In his smooth and immaculately soulful style, Jimmy flits between classic, string-drenched soul, rare grooves, simmering disco and slick, dubbed-out electrofunk. As well as a couple of tracks from his new EP for us, you’ll find a bunch of other exclusives – details in the tracklist below. So there you have it, some people with great taste love it. You should go away and buy it when it hits stores. Not because they say so, of course, but because it’s ace. Incidentally, another of Jimmy’s edits is featured on the forthcoming Retrospective All Stars comp on Retrospective Records (that’s Ruben and Ra’s label). That release is well worth checking also. On Monday, our own Sell By Dave hosted the latest edition of Bedmo Disco Radio on Passion Radio Bristol. We’ve rescued the recording from the Passion archives and thought we’d share it with you. It’s a typically groovy two hour mix-up featuring a range of disco, electrofunk, P-funk, boogie, rare groove, soul, funk and deep house gems old and new. Excitingly, it also features previews of all four tracks from the forthcoming Awon & Bedmo Disco original production EP, “B-Funk”, two cuts from the excellent Jimmy The Twin edits EP we’re releasing in early May, and two yet-to-be-scheduled edits due to be released on our forthcoming sister label, Bedmo Digital. 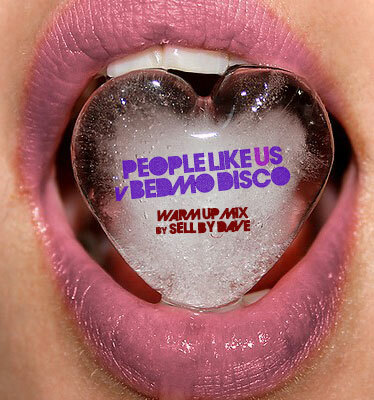 It’s all mixed together in Sell By’s usual vaguely slick, ‘floor-friendly style, and we think it’s rather good – one of the best Bedmo Disco Radio sessions yet. 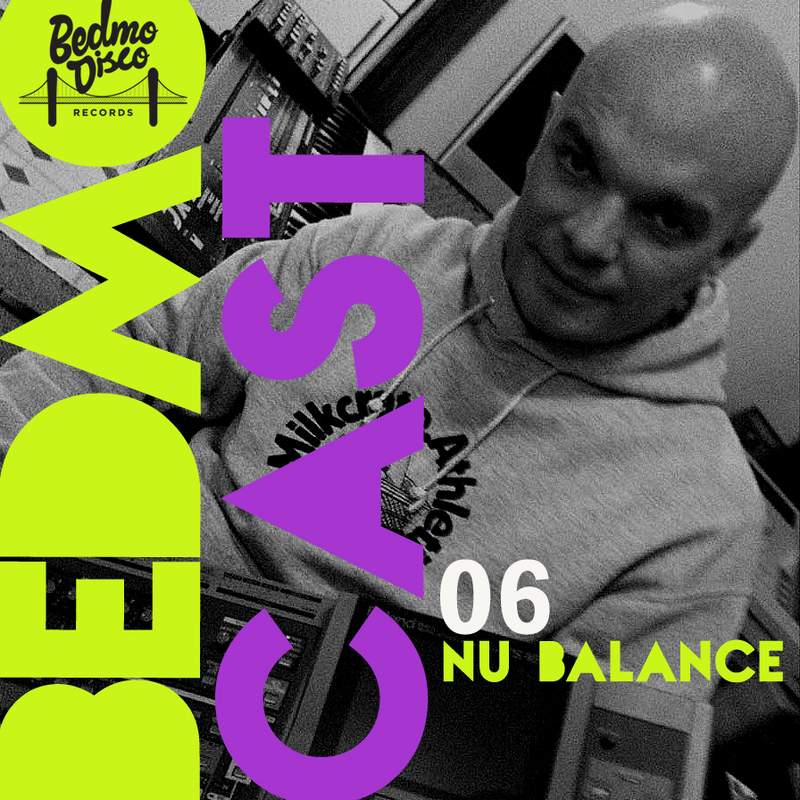 We’ve got something a little bit special for you this week – a new BedmoCast episode mixed by Bristolian turntablist legend and original Aspects DJ Nu Balance. Flitting between original boogie, electrofunk and disco with a dash of fun and soul, it’s a 60-minute journey though Nu Balance’s almost endless crates. 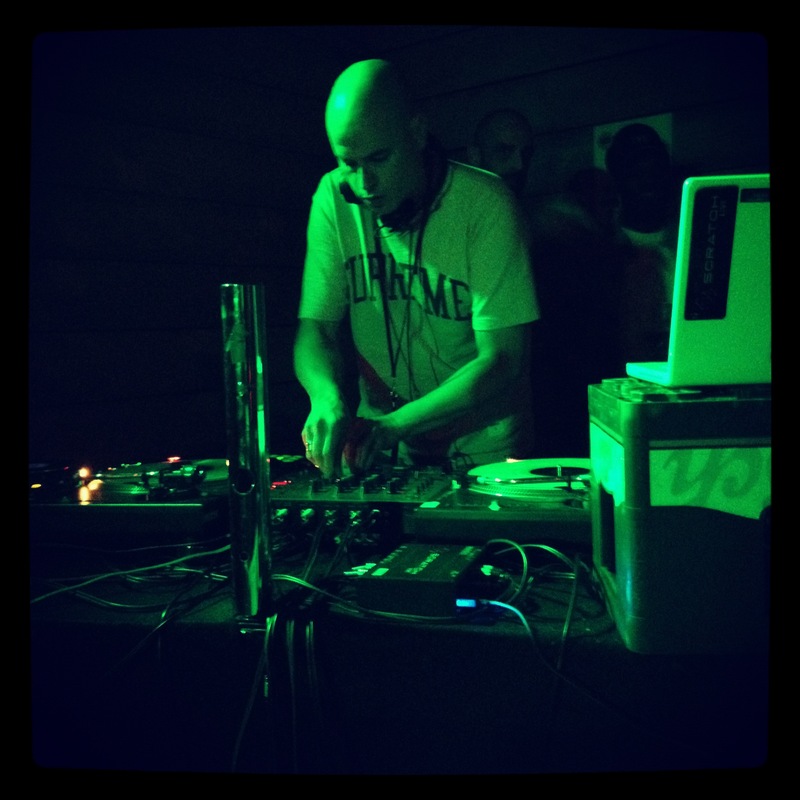 He also shows off some of the turntable skills – scratching, cutting, juggling – that earned him a fearsome reputation in his days with Bristol’s own Aspects crew. You can listen (or download, if you know how – check your browswer instructions etc) to Nu Balance’s fantastic BedmoCast mix by clicking on the link below. No tracklist, but suffice to say that every track is a killer – and there’s plenty of obscure and forgotten gems amongst the beats, grooves and boogie basslines.